The food. In a word, yuck. It’s not exactly news that Disney Cruises aren’t known for the quality of food. 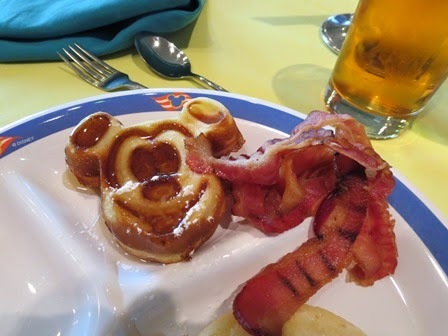 There were occasional exceptions (like the wonderful Mickey-shaped waffles! ), but the quality of most meals left something to be desired and dinner options were surprisingly limited. If we didn’t want to do dinner in one of the dining rooms, the only other option was to eat hot dogs or pizza. 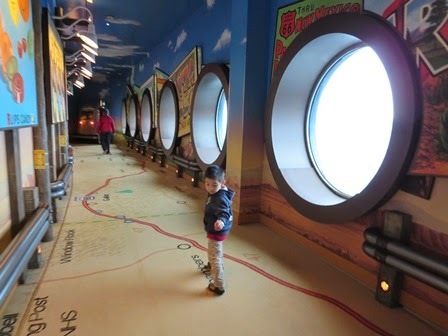 Unlike most other cruise lines, there is no come-and-go-as-you-like buffet option for those days when baby is fussy, when the kids are sleepy and jet lagged or when you just don’t feel like dressing smartly for the dining rooms. While food on the kid’s menu was especially poor (think greasy and heavily processed), on the plus side, the entree was always served with well-prepared fresh vegetables. The Navigator, the ship’s news was always delivered well after 10 pm, long after we would be asleep and therefore of little use in planning for the day ahead. While this didn’t matter much for sea days, it would have been nice to learn of the logistical details of some of the ports a bit earlier than having to rush through it while getting ready to get off the ship. The cabin bathroom. There is no question, the split bathroom is handy. However, neither of the doors would fully open, making entering and exiting awkward, wasting a lot of space and obviously making the toilet room more challenging to clean properly. Given that a large number of passengers are toilet training kids, the toilet had a less-than-ideal smell. The Kid’s Club. Don’t get me wrong, Disney’s two kid centers - the Oceaneer’s Club and Oceaneer’s Lab are great - lots of different activities and a fun play structure for the younger set. What made the kid centers less than ideal however were long lines to check in each morning and the huge bracelets kids have to wear to keep track of them on board. I am not exaggerating when I say they are huge, uncomfortable and poorly thought-out. It was ridiculously huge on B’s small wrist and he was screaming for it to come off after just a few hours. The clubs also accommodate so many kids, it felt a bit more like crowd control than a place where kids had much personal interaction with the staff. B is pretty easy going but he literally hated going there. The noise. I know… we were on a cruise ship full of kids and extra noise is to be expected. But we were awakened almost every night by kids laughing, screaming and running through the hallways well after midnight. The staff. Let me premise this with the exceptions: Our waiter, assistant waiter and cabin attendant were wonderfully friendly and helpful. Unfortunately I found the rest of the cast members less so. Many crew members seemed downright disinterested and many did not know the ship well enough to even point the direction to the dining room. I got the distinct impression the ship had just done a large switchover of staff but don’t know if this was actually the case. The Pixar Party – the cruise’s signature event, and a party B was really looking forward to – was moved from its regular 7:30 pm time to 10:15 pm, to allow an adult comedian to perform in the earlier time slot. With the 3-hour time difference from home, this was like having the party at 1:15 in the morning. B was asleep well before the party even started. Booting the Pixar Party from ‘prime time’ in favor of an adult show was perplexing to say the least. The production shows are well done but they really aren’t targeted to young kids. Mickey rarely made an appearance and the Toy Story show, while visually splendid, had a distinct focus on the scarier elements. B’s grandparents and I enjoyed the highly polished shows, but B (who really should have been the audience for the show) did not. The onboard elevators were very small. This made getting using a stroller particularly awkward as only one would fit in the elevator at one time. This issue was particularly frustrating to passengers on board using wheelchairs. While we had the option of collapsing the stroller and walking up or down several flights of stairs, this is not an option for everyone. The muster drill was chaotic and disorganized. Again, I wonder if the ship had recently undergone a large-scale employee turnover, but whatever the reason, I was left feeling uneasy about the ability of staff to deal with any emergencies that might arise. Dinner times. I can’t really put this on Disney but there was a decidedly different air from other cruises we’ve been on. With so many kids at neighboring tables using the cutlery as a table toy, it hardly allowed for a relaxing family meal. Adding to that, I felt uncomfortable watching parents ask their servers to cut up their children’s food for them. And, this happened a lot. The Disney Wonder isn’t one of their newer ships but it was well-maintained, many areas had been recently renovated and the ship (with the exception of our bathroom) was spotlessly clean. Bathtubs in every cabin. Cute, kid-sized bathtubs meant this was one cruise where I could leave our inflatable tub at home. Our cabin was roomy and it had LOTS of storage space. B had his own pull-out bed divided from the rest of the cabin by a well-placed curtain. The cabin also had a childproof balcony safety latch, something that is frequently lacking in many other cruise line cabins. Another bonus was the refrigerator, which rather of being stocked with loads of additional-cost items, was left completely empty so we had lots of room to keep B’s milk and other snacks. Wi-Fi, while typically expensive, was strong throughout the ship, including in our cabin. Wonderful retail shops with some really cute merchandise – great for mementos of our Alaska cruise, and for taking home as souvenirs for all the cousins. 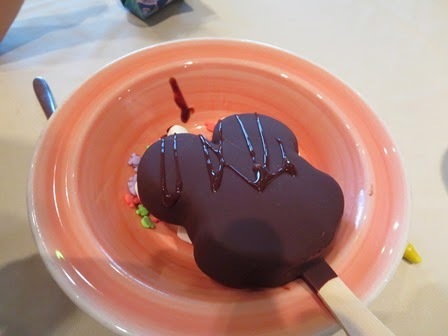 5 words: Mickey Mouse ice cream bars. Need I say more? 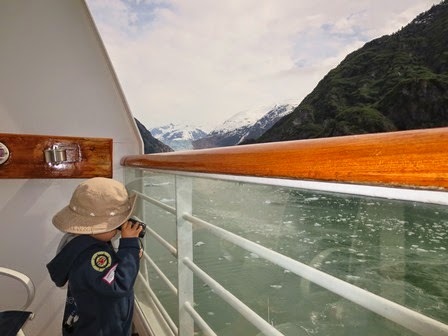 Our Disney Cruise wasn’t all bad – we absolutely loved Alaska, but I don’t think we’ll cruise with Disney again. I can’t I help but think the money would have been better spent at a Walt Disney Resort hotel instead. Every cruise line has its strengths and weaknesses and Disney’s cruises will work very well for a lot of people. It just didn’t work for us. Have you been on a Disney Cruise? What was YOUR experience? Reasons not to take baby on a cruise? No way!